It is early morning December 7, 1941. While most of the people of Hawaii are still in bed, Admiral Yamamoto orders his six carriers to turn into the wind. Within one hour 350 torpedo bombrs, dive bombers, and fighters are on their way to attack the American pacific fleet at Pearl Harbor. This is the largest carrier strike in history, and if it is a success, it will eliminate America's ability to oppose the expanding Japanese empire long enough for them to capture and fortify their objectives throughout the pacific. As the force begins its attack, they realize that they have achieved total surprise. However, they also realize that the main objective of their attack, the U.S. carriers are not present. By a stroke of luck, the carriers had left on an aircraft ferrying mission. Now the attack, though devastating, would not be the crippling blow that was desired. As a result, America will be able to resist Japanese expansion much sooner than anticipated. You will command either the forces of the Japanese Empire, or the forces of the United States. The tasks of both are daunting. 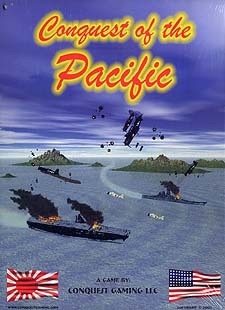 As Japan, can you complete your conquest of the pacific before America can build up enough to oppose you? Will you be able to fortify your new empire quickly enough to fend off the inevitable American counter attack? As the United States, can you rebuild your navy, and raise an army quickly enough to stop Japan from dominating the entire pacific? These questions, and more, will surely be resolved in Conquest of the Pacific!